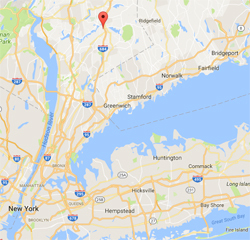 Martha Stewart's Farm is about an hour's drive north of New York City. Read Martha's Blog about Our Visit Here. 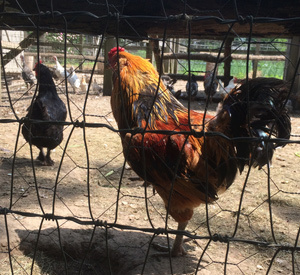 Martha's poultry pens, which house a diverse flock of heritage chickens, roosters, turkeys, and geese, border the summer vegetable garden. These 'Takrima' leeks (bottom) will reach maturity during the fall-harvest slot. How did your love of gardening first develop? I have been gardening since childhood, and was taught excellent gardening techniques by my father and other gardening mentors. I am an avid gardener and plan every aspect of my gardens. With three large homes and gardens, I've devoted a good deal of time and energy to growing a wide variety of plant and tree material. As a student of horticulture I constantly research and study many different types of gardening, and my favorite pastime is visiting other people's gardens to get new ideas. I credit my dad for instilling in me a love of growing all types of plants — from decorative begonias, cycads, agaves, and staghorn ferns, to a very extensive assortment of perennials, trees, and shrubs. A recent interest is growing productive citrus in pots and reestablishing woodlands using seedling trees. What do you feel you share in common with Johnny's readers and followers? All serious gardeners need advice, and each searches for sensible solutions to everyday challenges. We all need and want excellent growing tools, including seeds, plants, and growing mediums. I discovered Johnny's years ago and have been an aficionado ever since. I admire the high quality, the innovative and creative solutions, and the beautiful performance of the seeds. And Johnny's has been consistently responsive to the needs and wishes of the farmer, professional or amateur. Have you learned anything in particular from our partnership? I particularly like the fact that Johnny's employs the genius and expertise of experts like Eliot Coleman, whose innovative tools help solve problems and make chores easier. It's great to hear Martha's story in her own words. Like Eliot Coleman, she has inspired so many of us to learn to do things at a level of excellence we may not have imagined ourselves capable. And, in this 20th year of Eliot Coleman's participation on Johnny's Tool Advisory and Design Team, we tip our caps to both these icons of the grow-it-yourself renaissance. On the day of the tour we arrived early so that Ryan and our Tools & Supplies Manager, Adam Lemieux could demo some new tools together. We were greeted at the property's entrance by Ryan; Jocelyn Santos, Martha's media producer and blogger; and Shqipe Berisha, Martha's personal assistant, who accompanied us to a nearby Victorian-style glasshouse. Here's a look at the glasshouse exterior (above right), flanked by a wide border of currants, gooseberries, and raspberries. Behind Jocelyn are some of the most extraordinary climbing hydrangeas in existence (at left, and inside the dotted ellipse at right). Entering between a pair of Camperdown elms, we found ourselves in the midst of Martha's extensive collection of exotics (below). Each of the long, tightly packed benches glides smoothly across rolling pipes to allow easy maintenance of the begonias, orchids, succulents, and dozens of other tropical and subtropical specimens. 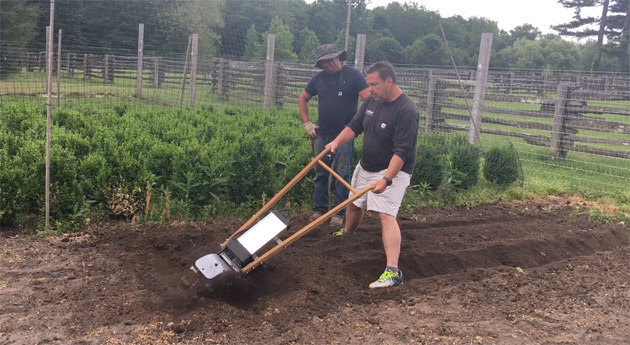 Next we headed for the workshop at back of the glasshouse, where Adam and Ryan reviewed the mechanics of Martha's shiny new Four-Row Pinpoint Seeder and its corresponding Four-Row Cultivator. Perfect for limited-space sowing and weeding, these tools will be put to appropriate use in Martha's four-season vegetable greenhouse. The office is neat as a pin, its shelves brimming with gardening tools, implements, and Martha's classical clay pot collection, many of which are the creations of renowned potters Guy Wolff and his son, Ben. All the various potting media — seed-starting mix, vermiculite, perlite, and sphagnum — are conveniently stored directly beneath the workbenches in Wilder stainless steel baker bins. Before we began our walking tour, Shqipe handed each of us a map of the property. Originally established in 1770, the farm now comprises over 150 acres, graced by several meticulously restored houses and barns, a stable complex, four chicken coops, a peacock house, five greenhouses, extensive formal and cutting gardens, and a diversity of paddocks, groves, and woodlands. All these various elements are neatly stitched together by a 4-mile carriage road, tree- and boxwood-flanked allées, walkways, terraces, footpaths, and horsetrails. Clearly, upkeep of a property of this scale is an enormous undertaking, but the crew responsible is surprisingly small. Ryan explained that Martha is an early riser, and she will often have accomplished an astonishing number of tasks herself by the time the crew arrives each morning. Although we walked just the southwesternmost corner of the property, this took us well over an hour to cover. We exited at the back of the glasshouse workshop directly into Martha's cutting garden, now in its fourth year, where a generous swath of lavender was just coming into bloom (see above). The layout is divided into sequentially-blooming quadrants, with the western half predominated by earlier-blooming flowers such as poppies and iris, and the eastern half by types that blossom later in the season, such as rudbeckia, verbena, and lilies. Roses and foxglove dot the entire garden. Heading north along the pin oak allée that borders the southeast paddock, we passed by a freshly planted 200-tree orchard surrounding the recently installed swimming pool (above left). Turning west at the end of the paddock brought the majestic stone stable complex into view at the apex of a mature boxwood allée (above right, where we also see Shqipe multitasking, Martha-style, as she leads chow chow mom, Peluche for her mid-morning walk). As we strode along, Ryan and Shqipe described how the boxwoods are hand-sewn into burlap covers to protect their boughs from damage by winter snow and ice. Sewing begins around Thanksgiving each year and usually wraps up around the New Year! All the creatures at Martha's enjoy a marvelous view — each summer her potted silver Bismarckia palms line the cobblestoned courtyard of the stables. Inside, we enjoyed a meet-&-greet with her celebrated Friesians, ponies, and donkeys. We then meandered through a series of groves that include catawba, tupelo, aesculus, crabapples, hollies, spruce, and other deciduous shade trees. This brought us to the summer house, where we passed through a stately boxwood parterre accented by alliums. A faux bois sundial and monumental ginkgo serve as the focal point. To finish our tour, we ascended onto the terrace of Martha's winter house for fresh-baked cookies and icy-cold pomegranate punch. Working at Johnny's often provides us with the opportunity to meet, talk, and correspond with farmers and gardeners of diverse walks and styles. Whether it's with our agrarian elders or our "youngers," the way we grow is directly influenced by these interactions. Not every day is as relaxing as this one, but learning from others is one of the best rewards of working here. 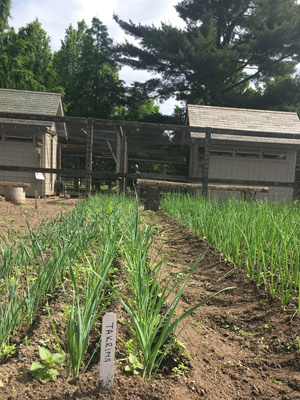 Visiting Martha Stewart's farm has given us a memorable glimpse into the world of this deeply committed gardener–educator.